To Apple's lawyers, Android must seem like a nightmare. 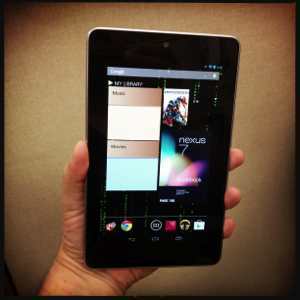 Google's superb 7-inch Nexus 7 tablet. My recent columns about cheap tablets brought a hailstorm of mail. I figured I'd better tell you what's going on in the tablet market and why you should care. Let's start at the courthouse. Samsung, which makes more non-Apple phones and tablets than anyone else, recently lost a patent fight with Apple. After Apple sued the Korean company, a jury found Samsung guilty of copying Apple's design of the iPhone and iPad and therefore violating Apple's patents. But Apple's real target wasn't Samsung. Apple was aiming for the software used in Samsung's smartphones and tablets -- and in the phones and tablets made by hundreds of other manufacturers. Right now, there are three main operating systems for smartphones and tablets. All Apple devices use the "i" operating system, called iOS. Microsoft has a phone version of Windows, but we can ignore the Windows Phone operating system in this context because Windows phones aren't a force in the market right now. That leaves Android. And it's super big. A giant. To Apple's lawyers, Android must seem like a nightmare. First, Android is a Google project, and that means Apple has a slippery competitor. Is Google a search company? Is it a software company? Is it in the business of phones? Tablets? Does it have secret projects it could spring on its competition any moment? The answer to all those questions is yes. That makes Google a moving target. How do you compete with someone who can come up with slick new devices almost instantly? But, to Apple, something even worse is happening. Google doesn't sell the Android operating system; it gives Android away. Device manufacturers are free to do whatever they want with Android. They can customize it, give it a special look and add features. Google has scores of software engineers continually working on newer versions of Android, which manufacturers are free to use, adapt, reject or even improve. This is totally unlike the way Apple does things. Apple is in control of iOS. You'd expect Google to watch over Android development in some sort of motherly way, and it does. But while Google charges manufactures who want its help -- they have to pay a licensing fee -- nothing stops any company from skipping the license and going it alone. The Android tablet I reviewed a few weeks ago was a non-licensed device, meaning only that Google's app store wouldn't work. Every other function worked fine. Apple makes great phones and tablets. No one can argue otherwise. But iOS is a buttoned-up operating system. You work with your iPhone or iPad the way Apple intended you to, and that's that. You can't add extra storage using a memory card (there's no memory-card slot), you can't access files in any normal way and you can't add features that Apple didn't already provide for. The only way to customize an iPhone or iPad is to "jailbreak" the device by hot-rodding the operating system and voiding the warranty, something I can't recommend. But there's a dark cloud behind every silver lining. Android phones and tablets aren't universally well designed. Some are dreadful. But nearly all have the features iPhones and iPads lack -- easily added storage through plug-in memory cards, a navigable file system, USB connectivity for a printer, mouse or thumbdrive, as well as countless ways to customize the looks and features of the device. Android tablets have another advantage -- price. We'll take a look at the cost implications of Apple's competition next week.